I have a thing for carrots. I can’t really explain it. Maybe it’s their shelf life-when kept in a cool, dark place they’ll last a very long time, through the winter even. Maybe it’s their color-bright orange, a rarity in nature. Maybe it’s their versatility-delicious when eaten raw with dip, sliced on a salad, or cooked soft and swimming in a pool of butter. For some reason, when I ran across this recipe, I had to try it. It’s insanely easy. And it’s insanely delicious. A bit on the sweet side, it’s like a soufflé and it’s perfectly acceptable as a side dish for your next dinner. Plus, it’s really pretty. And did I mention delicious? Here’s the recipe, which I followed almost to the letter. It makes six servings. Boil the carrots in a saucepan for about 15 minutes or until quite soft. Preheat oven to 350 degrees. 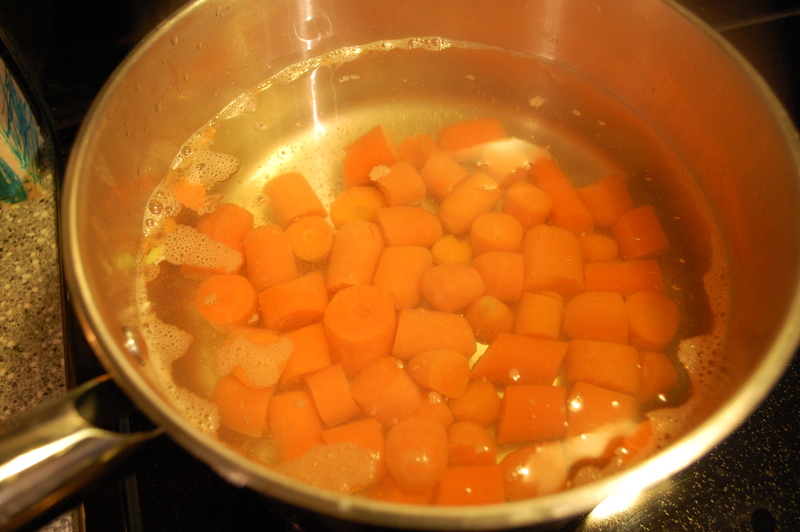 Drain carrots, reserving ¼ cup of the water in which you boiled them. 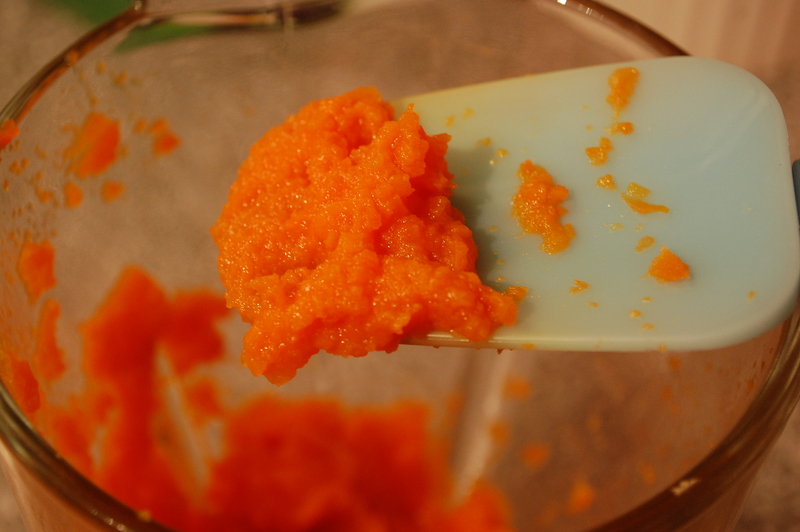 Place carrots and reserved water in a blender and puree until smooth. Pour carrots into medium bowl. Mix eggs, sugar, butter and spices into carrots and then beat thoroughly until creamy. Pour mixture into small oven-proof bowl lightly coated with cooking spray. Bake for one hour or until pudding is fluffy and a toothpick stuck into the middle comes out clean. I served this as a side dish and my daughters thought it was heavenly. It’s sweet and very pretty on the table. 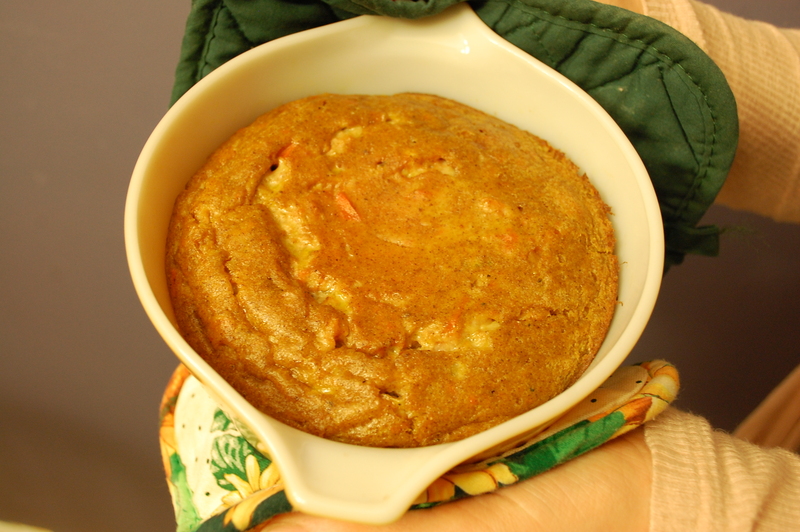 If you have trouble getting your family to eat carrots, try this recipe-and enjoy! Next blog post: French pancakes-known in the modern world as crepes! What a neat idea…I will have to try this! My kids love carrots, I bet they’ll love this as well! I, too, love historic recipes and find your writing and research quite good reading! I have a cookbook of old Appalachian recipes that my Mom picked up in NC- how many recipes and variations on corn flour can there be?! I baked a spoon bread recipe from it, and behold, using as much Salt as the recipes called for yielded a dish that my family wouldn’t eat, being too salty tasting. I commented to my mom who said that the physical labor and non-climate-controlled environments kept the people needing more salt, due to sweating. I discovered your site when researching making a Cherry Clafouti for the first time. I had a good laugh over Food of the Past Gone Wrong, and haven’t stopped reading here yet! My mother in law grew up on a farm, born just pre-Depression, but her cooking style truly does reflect the move to modern ‘convenience’ foods. Thank you, and keep up the work! Thank you! I have also noticed how many different versions of corn meal bread/muffins there are in those old cookbooks. It’s the same with yeast bread… I’m thinking once you figure out the recipe, why make 100 variations? Perhaps they were bored! I’m glad you enjoy the blog.